Mild winters in Northern Europe are thanks to the Gulf Stream, which makes up part of those ocean currents spanning the globe that have always impacted the climate. Yet our climate is also influenced by huge eddies, black holes of turbulence over 90 miles in diameter, that rotate and drift across the ocean. Their number is reportedly on the rise in the Southern Ocean, increasing the northward transport of warm and salty water. A good thing, because this could moderate the negative impact of melting sea ice in a warming climate. Yet quantifying their impact so far has been difficult, because the exact boundaries of these swirling water bodies have remained undetectable. A new paper has outlined a new mathematical technique, Coherent Lagrangian vortices, to find water-transporting eddies with coherent boundaries. George Haller, Professor of Nonlinear Dynamics at ETH Zurich, and Francisco Beron-Vera, Research Professor of Oceanography at the University of Miami, said the challenge in finding such eddies is to pinpoint coherent water islands in a turbulent ocean. The rotating and drifting fluid motion appears chaotic to the observer both inside and outside an eddy. They sought to find order in chaos by isolating coherent water islands from a sequence of satellite observations. To their surprise, such coherent eddies turned out to be mathematically equivalent to black holes. Black holes are objects in space with a mass so great that they attract everything that comes within a certain distance of them. Nothing that comes too close can escape, not even light. But at a critical distance, a light beam no longer spirals into the black hole. Rather, it dramatically bends and comes back to its original position, forming a circular orbit. A barrier surface formed by closed light orbits is called a photon sphere in Einstein's theory of relativity. They discovered similar closed barriers around select ocean eddies. In these barriers, fluid particles move around in closed loops – similar to the path of light in a photon sphere. 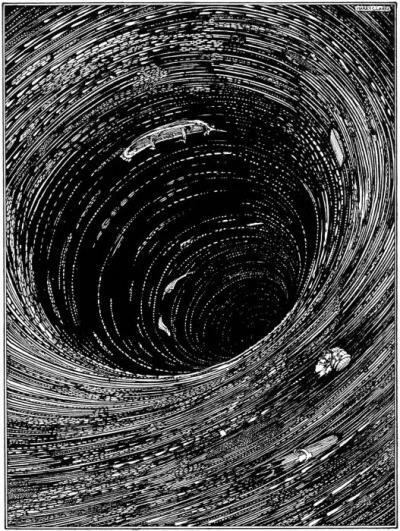 And as in a black hole, nothing can escape from the inside of these loops, not even water. 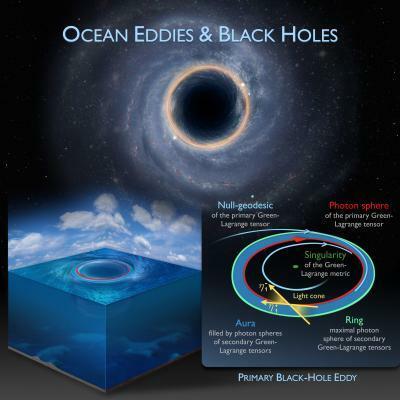 Because black-hole-type ocean eddies are stable, they function in the same way as a transportation vehicle - not only for micro-organisms such as plankton or foreign bodies like plastic waste or oil, but also for water with a heat and salt content that can differ from the surrounding water. Haller and Beron-Vera have verified this observation for the Agulhas Rings, a group of ocean eddies that emerge regularly in the Southern Ocean off the southern tip of Africa and transport warm, salty water northwest. The researchers identified seven Agulhas Rings of the black-hole type, which transported the same body of water without leaking for almost a year. Haller points out that similar coherent vortices exist in other complex flows outside of the ocean. In this sense, many whirlwinds are likely to be similar to black holes as well. Even the Great Red Spot – a stationary storm – on the planet Jupiter could just be the most spectacular example of a black-hole type vortex . "Mathematicians have been trying to understand such peculiarly coherent vortices in turbulent flows for a very long time", explains Haller. Just after the publication of Haller's and Beron-Vera's results, Josefina Olascoaga, also a Professor of Oceanography in Miami, tested their new mathematical method. She unexpectedly found a large, black-hole type eddy in the Gulf of Mexico. Olascoaga now uses her finding to assess the coherent transport of contamination from a possible future oil spill.